Posted by Ubi Dubium in Books, Brain Glitches, Humor. 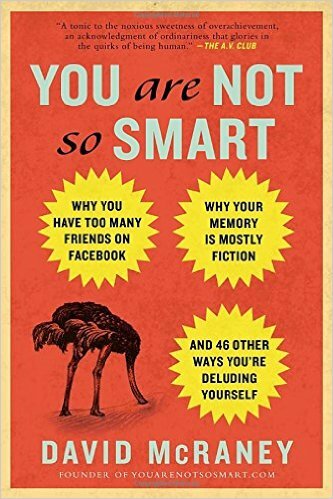 I may have mentioned that one of my favorite podcasts is called “You Are Not So Smart”. It’s a wonderful “celebration” of the human capacity for self-delusion. It started out as a blog, and then shifted over to a podcast. Each episode focuses on some particular way our brains don’t work, usually with one or more guests that are experts in the field. It’s pretty much the podcast I would make if I were going to do a podcast, except I don’t have to because it already exists. which is the thank you gift if he uses your recipe on the show! Yay! His review is at the end of this episode. Posted by Ubi Dubium in Books, Brain Glitches, Responses. Still reading Steven Pinker’s The Better Angels of our Nature. I’ve just finished the chapter on what it is about human brains that leads us into violence that ought to be avoidable. Again, this chapter really could be a whole book on its own. People, especially men, are overconfident in their prospects for success; when they fight each other, the outcome is likely to be bloodier than any of them thought. People, especially men, strive for dominance for themselves and their groups; when contests of dominance are joined, they are unlikely to sort the parties by merit and are likely to be a net loss for everyone. People seek revenge by an accounting that exaggerates their innocence and their adversaries’ malice; when two sides seek perfect justice, they condemn themselves and their heirs to strife. People can not only overcome their revulsion to hands-on violence but acquire a taste for it; if they indulge it in private, or in cahoots with their peers, they can become sadists. The chapter has a really detailed examination of each of these points. This is a really interesting book, and I wish it was required reading for every politician before they were allowed to take office.